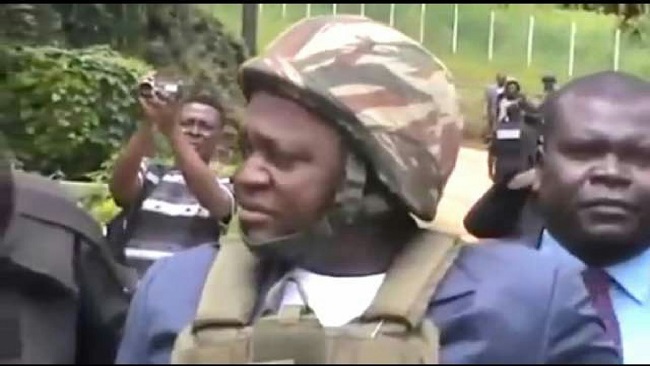 Bernard Okalia Bilia, the Francophone governor of the South-West region braved the bad roads to the Lebialem County, one of the six constituencies in the Southern zone of the Federal Republic of Ambazonia, at the end of the week to install the new prefect appointed on April 6 by President Biya, when his convoy came under attack. Tensions have continued to rise in Southern Cameroons ever since the Interim Government of the people of Ambazonia endorsed the policy of self defense in dealing with French Cameroun troops loyal to the 85 year old dictator. A series of attacks were carried out over the weekend in Southern Cameroons by the powerful Red Dragons of Lebialem, the Mighty ARA in Belo and the Manyu Ghost Warriors with the most serious being that on Sunday that targeted soldiers in Ekok and Otu in Eyumojock Sub constituency in the Manyu County and the “Good Friday” attack which targeted governor Bernard Oklia Bilia and his entourage en route to Lebialem. The convoy of the governor, escorted by a detachment of the Rapid Intervention Battalion (BIR), an elite unit of the French Cameroun army, was attacked on the way back and forth signalling difficult times ahead. No casualties have been reported but the governor was heard crying like a child. Heavy fire came from the much respected Red Dragons forcing Governor Okalia and his gang to drive at lightning speed into French Cameroun territory. Southern Cameroonians who are predominantly Christians commemorate the death of Jesus Christ, on a day that has come to be known ironically as Good Friday, on account of the salvation won for mankind by this otherwise tragic event, the central message that should not be lost on Ambazonia leaders is that sacrifice makes leadership. Jesus Christ spoke truth to power and paid the supreme price. He died a vicarious death to take away the sins of humanity and open the way to eternal life for all who believe in Him and in His message. The life, death and resurrection of Jesus Christ are a lesson on the power of humility, service, self-sacrifice and true love. Jesus taught a lot of lessons through his parables and miracles but perhaps the greatest lessons he taught are the practical lessons of his own life. Jesus taught his followers that there is no greater love than for a man to lay down his life for his friends, and that is exactly what he did. He taught his followers that those who seek to be first must make themselves last and servant of all; and that is what he did when he washed the feet of his disciples and accepted a humiliating death in order that they may live. Though as son of God He was rich beyond measure, He made a preferential option for the poor, whose circumstances He graciously shared. His life was consistent with His message. The present generation of Ambazonia leaders can learn a lot from the life and supreme sacrifice of Jesus Christ. Like the abducted Ambazonia leaders, the conflicts that led to the crucifixion of Christ centered on the social paradigm that Christ preached to the world. Like Sisiku Ayuk Julius Tabe and his co-travelers, the truth Jesus spoke was, of course, too bitter for his opponents to swallow and so they had to silence him. Yet, silenced in detention, like Jesus who was nailed to the cross, the power of their message was already immortal. Ambazonia is a spirit that will never die. Jesus of Nazareth profoundly and manifestly changed the course of history. His message of love, mercy and compassion, truth, justice, and freedom, has inspired some of the most progressive individuals and movements in human history. Yet His coming was inauspicious. There were no earth-shattering sirens and convoys to welcome Him; life in Bethlehem went on normally as poor Mary and Joseph went around looking for a room in an inn to stay. And finding none, they settled for a lowly manger, and there Christ was born. But from the child born in this manger was to flow the knowledge of the Supreme Creator, the grace of healing and the compelling message of salvation for mankind. This is why Christians see the birth of Christ in the flesh as the miracle of all miracles. Those who believe in His word and abide by His teachings have the assurance of everlasting life after death. But not all who saw Him even in His own time recognized Him and not all who recognized Him believed in Him. In the course of passionately preaching and living out the truth as he knew it, condemning the injustices of the day, Jesus came in regular conflict with the status quo and those who benefited from it. He was betrayed by his own disciple, Judas Iscariot, denied by his closest associate, Simon Peter; handed over to the Roman authorities by the chief priests of his religion and condemned to death by Pontius Pilate the Governor. He was politically murdered without due process by civil authorities who made the cause of religious bigotry their own. Ambazonians must capitalize on the best ideals of their various faiths to transform their struggle for independence by keeping their eyes on the big picture, instead of fighting each other for positions. The victory of good over evil, which Jesus represents, questions the widespread corruption, greed and selfishness that define the present power struggles amongst Ambazonia leaders. The instant gratification mentality that pervades the Ambazonia leadership contrasts sharply with the sacrifice and selflessness which Christ’s death and resurrection symbolizes. The propensity for seeking to lead; the disposition towards crass materialism and blind pursuit of pleasure is clearly at variance with the lesson of Good Friday. On the whole, the teachings of Christ, anchored on humility and service in leadership seem to be lost, especially amongst the Ambazonia leadership, where the forces of greed and corruption continue to thrive. Those who aspire to lead the struggle must embrace those higher values of leadership exemplified in Jesus Christ. When Anglophones abandon hypocrisy and live out the higher ideals of self-less service, redemption is possible and victory is all but assured. We know who the enemy is; so whose side are you on? THE COWARD GOVERNOR WOULD ORDER OTHER PEOPLE TO GET KILLED BUT THIS HYPOCRITE WOULD SHIVER ACCORDING TO YOUR REPORT LIKE A BABY WHEN FACED LIKE DEATH. I WISHED THIS FOOL WAS SUCCESSFULLY ELIMINATED.